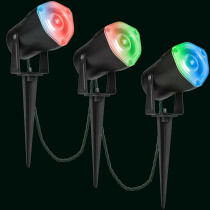 Brighten your yard with Color Changing Spot Lights. These colorful lights are perfect for lining pathways and landscaping. The festive lights enhance any outdoor scene.